DAYTON, Ohio – As one of four riders to deliver a flawless performance inside the Nutter Center, 2017 PBR (Professional Bull Riders) Rookie of the Year Jose Vitor Leme (RIbas do Rio Pardo, Brazil) captured his second Pendleton Whisky Velocity Tour event of the season in Dayton, Ohio, victorious at the Dayton Rumble. The 22-year-old began the event in electric fashion, winning Round 1 with an 86.5-point trip aboard Thunder on Hooves (Dakota Rodeo/Chad Berger/Clay Struve/Heald Pro Bulls). Leme then brought the crowd to its feet when he made the 8 aboard Free Wiskey (Dakota Rodeo/Chad Berger/Clay Struve) for 86 points, the top marks in the championship round. The win is Leme’s second of the season on the Velocity Tour, victorious in December at the Corpus Christi Chute Out in Corpus Christi, Texas. 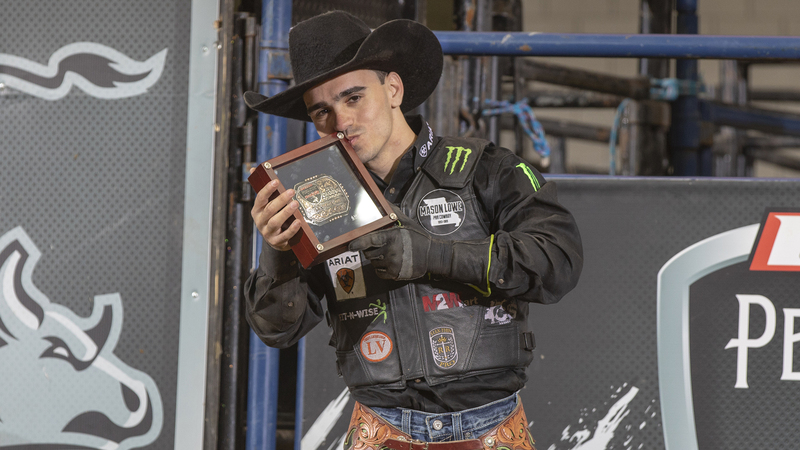 Additionally, the Brazilian young gun has now won two consecutive events, topping the leaderboard at last weekend’s PBR Unleash The Beast’s U.S. Border Patrol Invitational in Duluth, Georgia. For his perfect performance in the Buckeye State, Leme earned $7,300 in addition to 220 world points. Maintaining his world No. 3 ranking, Leme closed the gap on current No. 1 Jess Lockwood (Volborg, Montana). He now trails the top spot by 115.84 points. Lindomar Lino (Anapolis, Brazil) recorded his best finish of the season at the Dayton Rumble, concluding the event second. After first covering Space Plane (Mike Miller Bucking Bulls) for 84 points to tie for sixth in the first round, the Brazilian cowboy quickly climbed the event leaderboard after riding Grand Slam (Big Rafter Rodeo, LLC) for 85.5 points in the championship round. Lino leaves Ohio with a check for $4,400 in addition to 90 world points. He is now No. 48 in the world. Third went to Joao Ricardo Vieira (Itatinga, Brazil) who earned $2,700 and 55 world points. Vieira’s 2-for-2 effort included an 84-point trip on Tequila Slinger (Dakota Rodeo-Chad Berger/Clay Struve/Ken Barnhard) in Round 1, followed by an 85-point ride aboard Louisiana Man (Dakota Rodeo/Chad Berger/Clay Struve) in the final round. Much like his countryman Leme, Vieira maintained his world No. 2 ranking, however closed the gap on No. 1 Lockwood. Vieira now trails the Montanan by just 47.5 points. As the final rider to be flawless inside the Nutter Center, Joao Augusto Cezere (Sao Miguel Arcanjo, Brazil) recorded his career-best finish on the Pendleton Whisky Velocity Tour placing fourth. Netting $1,700 and 20 world points, Cezere’s qualified rides were atop Underdog Hombre (Cooper Bucking Bulls) for 84.5 points and Mac The Knife (Dakota Rodeo/Chad Berger/Clay Struve) for 80.5 points. Rounding out the all-Brazilian Top 5 was Alex Marcilio (Macaubal, Brazil), whose performance was highlighted by an 85.5-point tide on The Lodge (Dakota Rodeo/Chad Berger/Clay Struve) in Round 1. Marcilio earned $1,740 and 40 points. He is now ranked No. 50 in the world. On a night that saw 17 different riders record qualified rides, two additional cowboys also earned world points in Dayton. Tied for sixth, Kyle Jones (Troy, Missouri) and Allen Burkholder (Millersburg, Ohio) each collected 12.5 world points and $940. Earning matching 85-point scores in Round 1, Jones conquered Lab Rat (Cornwell Bucking Bulls/Circle G/Coleman), while Burkholder bested Slow Ride (Mike Miller Bucking Bulls). In the bull pen, Mud Duck (Cornwell Bucking Bulls/Circle G) was the high-marked bull of the event. The bovine athlete earned a 43-point bull score in the opening round courtesy of his 2.72-second buckoff of Junio Quaresima (Meridiano, Brazil). The PBR Pendleton Whisky Velocity Tour will next travel to Fresno, California and the Save Mart Center on Friday, March 22 and Saturday, March 23 for the Fresno Invitational. Fans can relive all the action from the Dayton Rumble starting at 8:00 a.m. ET on Sunday, March 17 at RidePass.com or via the mobile app.